Immediately recognizable due to their unique “hippopotamus” head shape, profile and wrinkles, the Shar-Pei is an ancient breed that is usually aloof and standoffish with strangers, but devoted to his family. Their name “Shar-Pei” means sandy coat and their coat should be offstanding and harsh. Any solid color and sable is acceptable and none of these is preferred over the others. Today, the Shar-Pei is exhibited in conformation, agility, obedience and tracking. Originally a multipurpose Chinese farm dog, many of the breed’s characteristics relate to that work. Their moderate sound structure allowed them to be perimeter guard dogs, working all day. They have retained vermin catching, herding and tracking skills, as their role on the farms was diverse. Physically, the Chinese believed the breed’s scowl and the black pigmented mouth would scare off evil spirits and their imposing presence meant that most were never challenged. An intelligent and often stubborn breed, Shar Pei ownership needs careful consideration. They are bright and learn quickly, but early training and socialization are important, as is daily exercise. 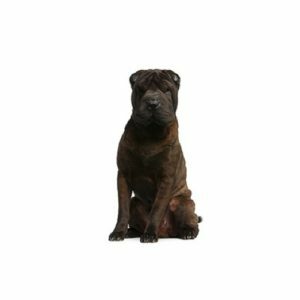 Shar-Pei are clean dogs that require little more grooming than an occasional bath, regular ear cleaning and toe nail clipping. Are you interested in purchasing a Shar-Pei?